IMF director Christine Lagarde speaks during a conference on "Africa"s Future: Responding to Today"s Global Economic challenges" in Lagos, Nigeria. 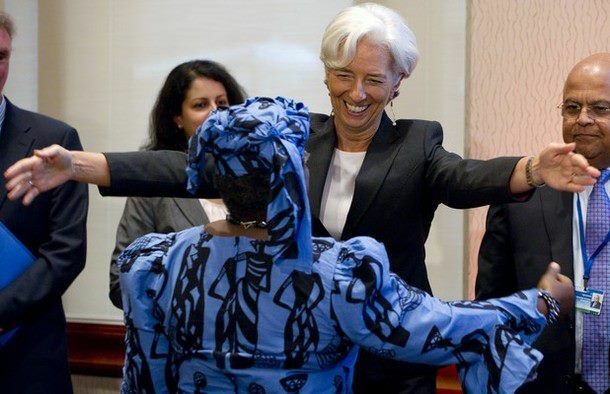 December 20, 2011.
International Monetary Fund (IMF) Managing Director Christine Lagarde called today for greater efforts to shield African countries from the crisis affecting developed economies, and to promote inclusive growth on the continent to create jobs and fight poverty. 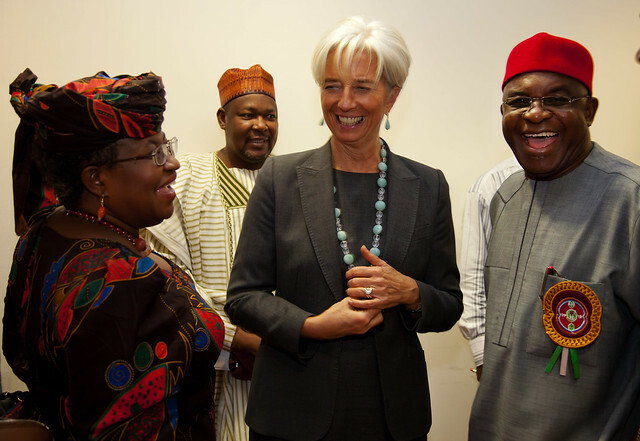 In a keynote speech to economists, academics and private sector representatives in Lagos, Nigeria, Ms. Lagarde said the IMF would stand by its African members through times of economic uncertainty. "These are challenging times for the global economy. The dark clouds of risk are gathering, and Nigeria and others in Africa will need to watch them carefully," Ms. Lagarde said. "While these problems might seem a world away, without action, the world economy could be swept into a downward spiral of collapsing confidence, weaker growth, and fewer jobs. And in today's interconnected global economy, no country and no region is immune to these risks." Ms. Lagarde said progress over the past decade-reduced budget deficits and public debt; lower inflation; and stronger foreign exchange reserves-had put sub-Saharan Africa on a fundamentally stronger footing to face the food and fuel crisis of 2008 and the global financial crisis that followed. An effective response from policymakers had ensured most countries in the region were able to maintain critical spending on health, education and infrastructure and allowed their economies recover quickly to the growth levels of the mid-2000s. Nevertheless, those crises took a toll on Africa's efforts to reduce poverty, she said. "The potential for greater volatility in commodity markets could cause further disruptions, with winners and losers within the region," Ms.
Lagarde said. "Faced with these risks, my main worry is that many countries do not have as much capacity to absorb shocks as they did three years ago. Added to that, the global slowdown could be more pronounced this time around. Policies need to tread a fine line between defending against the global slowdown in the near-term, while also preserving fiscal resources for investment in much-needed infrastructure that will help promote employment and growth." 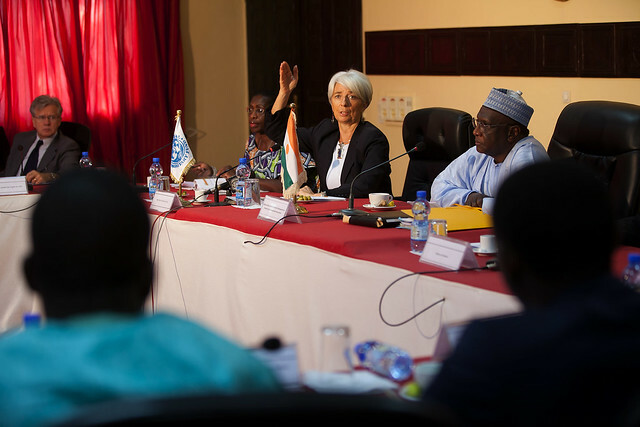 Ms. Lagarde stressed the IMF's commitment to help its African members navigate the troubled waters ahead. "The IMF is here to support you and be a better partner for you. I am committed to a deeper, more fruitful dialogue, with the IMF listening even more carefully to your needs. This will help us serve you even more effectively," she said. "We have also been working hard to reform the IMF's governance structure so that emerging market and developing countries have a greater voice in the institution. And, so we can be truly representative of our membership. "For those countries that need it, we have boosted our concessional lending capacity and made our lending instruments more flexible, with greater protections for social spending. We are also redoubling our efforts to provide quality technical advice," she added. "We can also play an important role, through our four, and soon to be five, regional technical assistance centers in Africa, of facilitating a sharing of expertise between countries." Read 7434 times	| Like this? Tweet it to your followers!